Learn just what the typical tuition is for U.S. schools, and how Fresno State measures up. Learn how fees and tuition at Fresno State measure up to other U.S. colleges and universities and find out what you can do to successfully get ready for probable college tuition growth. How Does California State University - Fresno Compare to Other Colleges? For nationwide, regional and statewide comparisons, view the table below to find out how Fresno State compares to other colleges. The cost of tuition and fees at Fresno State is dramatically lowered for students from California. Tuition and fees for in-state students is set at $6,585 for the 2017 - 2018 year, a 64.3% discount off the price charged to out-of-state students. Tuition is $5,742 and fees $843. Out-of-state students at Fresno State spent $18,465 in fees and tuition in 2017 - 2018. $843 was for fees, and $17,622 was charged for tuition. How much does Fresno State cost part time? 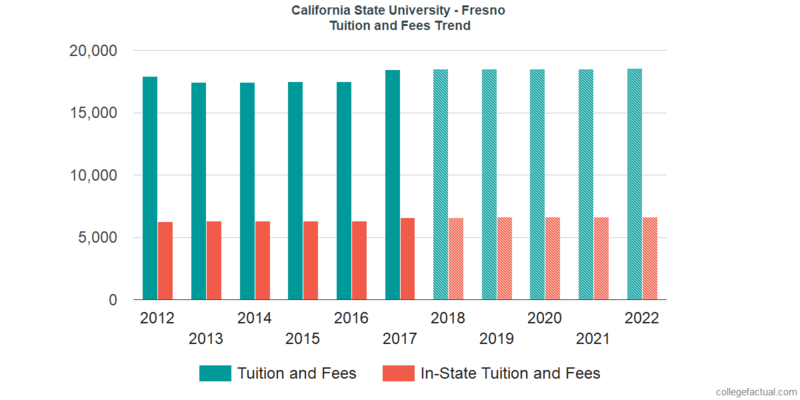 California State University - Fresno tuition and fees for out-of-state students increased at a standard annual rate of 0.1% within the last five years. Over that same period, tuition increased by 0.0% and fees increased by 1.5%. Due to this, we predict the price of tuition and fees for this year will be $18,478. At this rate, we estimate the total cost of tuition and fees for a two year degree to be $36,969 and $73,989 for a four-year degree. This doesn't include other costs including room and board, books, and transportation. See projected potential tuition and fees for Fresno State students which includes residency based reductions in the next chart. Be aware of just how much the tuition and fees are rising yearly. At most colleges students will wind up paying a higher price for their last year of school compared to what they did for their first.